The UAE has announced that India will be the Guest of Honour country at the Abu Dhabi International Book Fair, ADIBF 2019, to be held at the end of April 2019. The fair aims to highlight the UAE’s rich heritage, showcasing its authenticity and modernity, as well as its cultural and literary output. 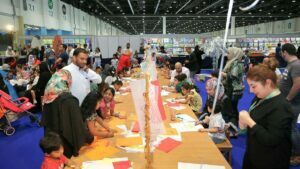 India’s participation in the fair will attract a significant increase in the number of visitors with various events and activities which will be held throughout the entire duration of ADIBF.